Here's a bizarre lottery coincidence story from China. It was reported in the Chinese newspaper, translated as, Modern Evening Times (MET). The story is about two winners of the Chinese lottery in April 2009. They each won 5 million yuan, one lived in Henan and the other Heilongjiang. These two towns are thousands of kilometers from each other. Okay, not too strange so far but they both picked out the same number of 3511587 - which, I guess, they would have had to do if there were two winners. But now here is the bizarre coincidence bit: The two gentlemen concerned picked these identical numbers at exactly the same time - right down to the second! 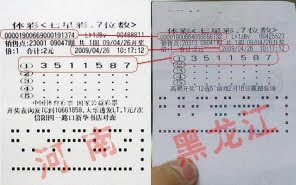 They were both purchased on 2009/04/26 at precisely 10:17:12 - and their tickets, as above, prove this. For this lottery there were over 10 million numbers picked by players and at peak times over 100 transactions took place every second. The reporter in the MET, Zhang Feifei, also added as a bonus coincidence, "Interestingly, the two big winners also had the same height, weight, and blood type." An assistant professor of mathematics at Heilongjiang University in China has had his calculator on overdrive to work out the odds of this happening - the lottery bit that is, not their height and such. This is what the prof, He Chunyang, worked out, "Suppose you pick a two-digit number using the digits 1 to 9. That makes 81 combinations. If you have two seven-digit numbers with an identical sequence, the probability is 1/282429536481 (one in 81x81x81x81x81x81), or roughly one in 282 billion. And when you factor in the two players thousands of kilometers apart who bought tickets at precisely the same second, the probability approaches zero." Not sure I understood all of that but he seems to be saying that it's virtually impossible for two players to pick the same numbers at exactly the same time - but they did, and this is what happens in the world of coincidences and synchronicity: the virtually impossible actually happens. That's an incredible situation you allude too and the astronomical odds of such a situation occurring, is just mind boggling. I know of a guy in Canada who won the lottery jackpot twice. With it being almost fourteen million to one to win the lottery based on getting six correct numbers out of forty nine, I can imagine the odds of winning the 'big one' twice is almost bordering on uncalculable. Of course, I wonder why he felt the need to play again.